When a customer-service rep goes above and beyond to try to solve your problem, that's welcome. When they spend 10-and-a-half hours on the phone giving you advice about relocating to Las Vegas, that's Zappos.com. Unlike many other online retailers (including parent company Amazon.com), Zappos plasters its site with its toll-free customer service number, which is staffed 24/7. When a Midwestern college student called the site's Nevada headquarters two weeks ago to buy a pair of Uggs boots, the transaction turned into a chat marathon about the city, where the student was considering moving. The rep was able to take some breaks during the call; the customer agreed to hold the line. Zappos spokesman Jeff Lewis said providing good customer service is a top priority. "We feel that allowing our team members the ability to stay on the phone with a customer for as long as they need is a crucial means of fulfilling this value," he said via email. By assuring management that it wouldn’t interfere with Zappos’ free-spirited corporate culture when it acquired the shoe retailer in 2009, Amazon benefits from the customer-service elements that make Zappos customers so loyal. “Amazon has purposely allowed that culture to continue to proliferate,” said Bryan Pearson, president of LoyaltyOne, a loyalty marketing and strategy company. “I’m sure they’re bringing some of the key lessons from the Zappos experience into Amazon." Jordy Leiser, CEO of Stella Service, a customer service measurement and ratings business, said this is the case. In a study conducted a few months ago, Zappos tied with L.L. Bean for the best customer service on Twitter. Leiser said that when Amazon saw how much customers liked being able to solve customer service issues over the microblogging site, it started offering customer support via tweet, too. Zappos had been using Twitter to field customer queries since 2008. "They are starting to integrate and rub off on each other," he said. Amazon didn't have poor customer service beforehand, according to Stella's research; it just wasn't the focus of the shopper experience. "In online, it's about fulfillment and a smooth shopping experience," Sucharita Mulpuru, an analyst with Forrester Research, said via email. In this regard, Amazon delivers, Leiser said. "They please customers with their shipping and logistics experience," Leiser said. Earlier this year, Amazon took over some of Zappos' back-end inventory-management processes, letting Zappos benefit from one of its strong spots. And both Amazon and Zappos ranked highly in Stella's survey of phone service responsiveness, with mystery shoppers able to reach live agents in about a minute, on average. "Each of them has the things that are most important to their customer base. 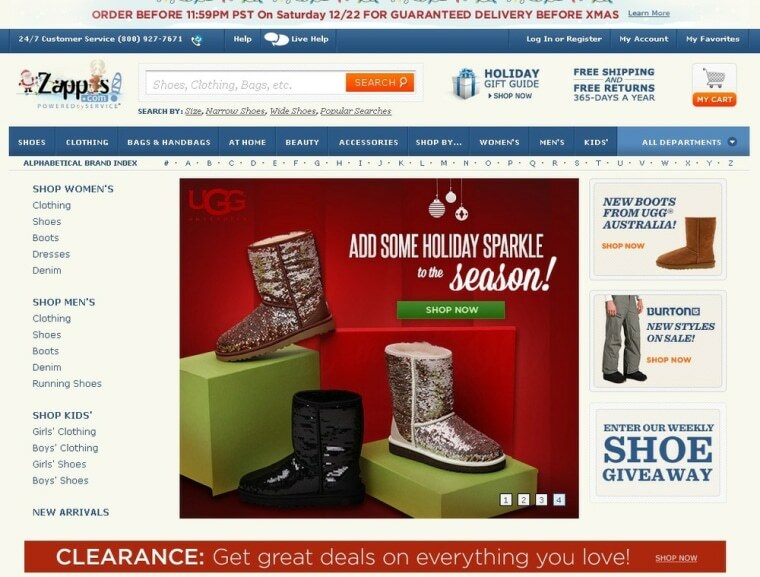 For Zappos, it’s all about the phone customer service," Leiser said. Apparently that service even includes a lengthy discussion about moving advice.